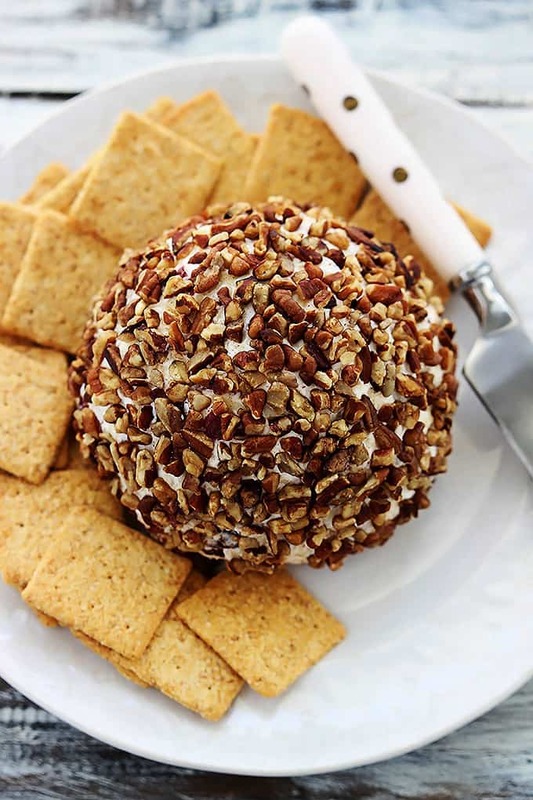 Cream cheese and sharp cheddar Cranberry Pecan Cheeseball! This classic holiday appetizer is always a hit and so easy to make! Today we are talking about one of the best foods ever known to mankind. CHEESE. When the holidays roll around there are two specific savory foods I look forward to more than any others and they have nothing to do with meat. In fact they are both appetizers. My mother makes about a zillion different “finger-foods” for Thanksgiving and she always, without fail, makes cheeseball and spinach dip. Real quick here – are you interested in a spinach dip recipe?? It is creamy with spinach (duh) and water chestnuts and we usually eat it with crackers and crusty french or sourdough bread. Yay/Nay? Now back to the cheese. My mother always makes a cheddar-ranch cheeseball with walnuts. If you want that recipe, I might be able to beg it out of my mother. But sometimes she makes a couple of other versions because we always run out (mostly because I eat 9/10ths of the cheddar ranch cheeseball all by my little self) and one of them is a cranberry version. Today I’m sharing my take on that cheeseball. Holidays are so busy and hectic, especially in the kitchen, the last thing you need is a complicated. This cheeseball is sooo easy! Just 4 ingredients, plus crackers. That’s it! The prep takes about 7 minutes and then you just let it chill until you’re ready to serve it up. I’m obsessed with the flavor combination that you get with the sharp cheddar and the tart cranberries – you will love it! 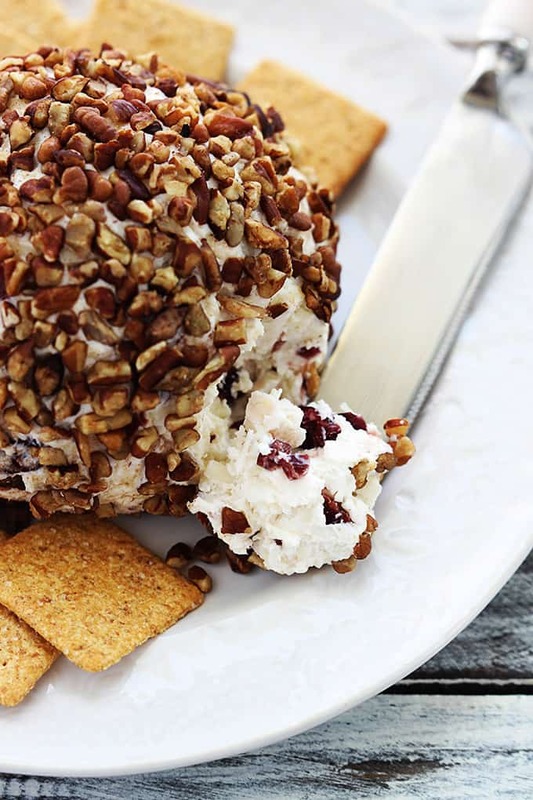 Cream cheese and sharp cheddar cheeseball with tart cranberries and crunchy pecans. This classic holiday appetizer is so simple and easy to make! In a large bowl mix together cream cheese and cheddar cheese until well combined. Mix in chopped cranberries. Lay a large piece of plastic wrap out on a flat surface. Scoop the cheese mixture out of the bowl and place it in the middle of the plastic wrap. Wrap the plastic around the cheese mound, then use your hands to shape it into a ball. Chill for at least 1 hour. 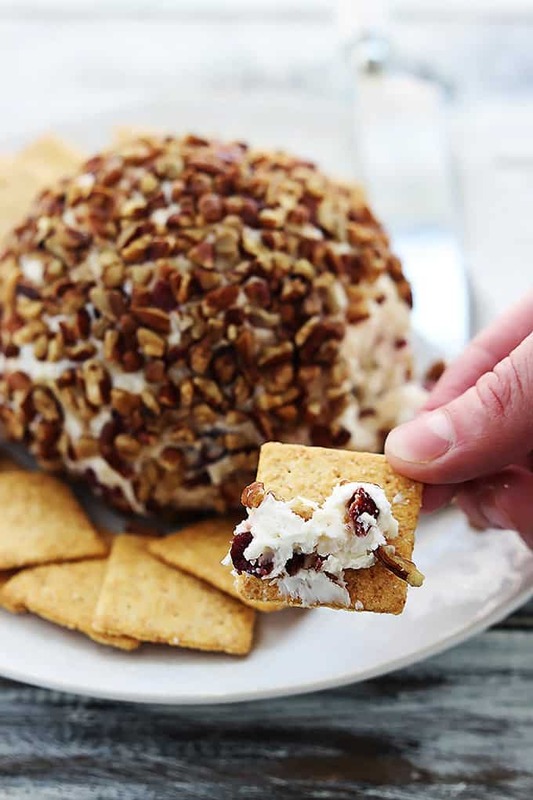 Unwrap the cheese ball and using small handfuls of nuts at a time, press the chopped pecans onto the outer surface of the cheeseball. (You don't need to cover the bottom of the cheeseball with nuts). Hey this looks familiar! 🙂 I love a good cheese ball this time of year, and can vouch that this one is fantastic! This is a great blend of flavors. So glad I got to try it. I would love your mom’s cheddar ranch cheese ball. Also your take on the spinach dip. LOVE your recipes!! 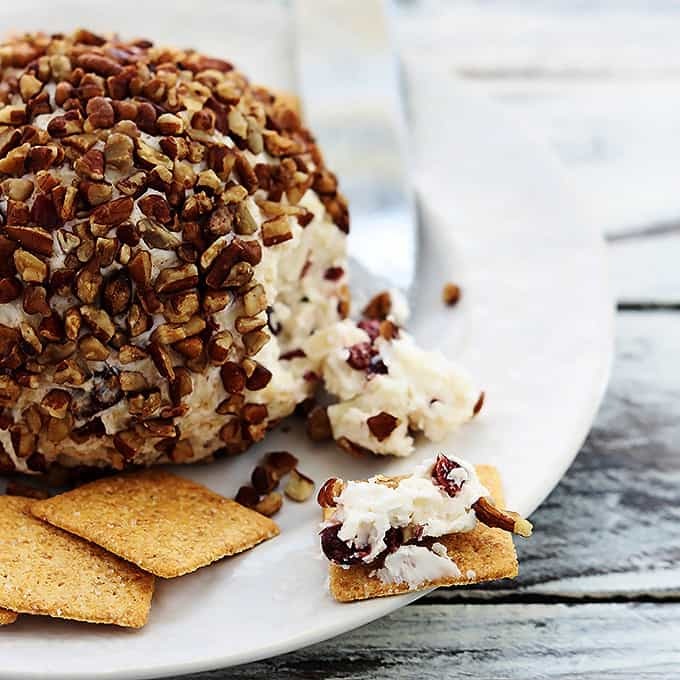 This cheese ball is all of may favorite things. I would eat the whole thing by myself for SURE~! 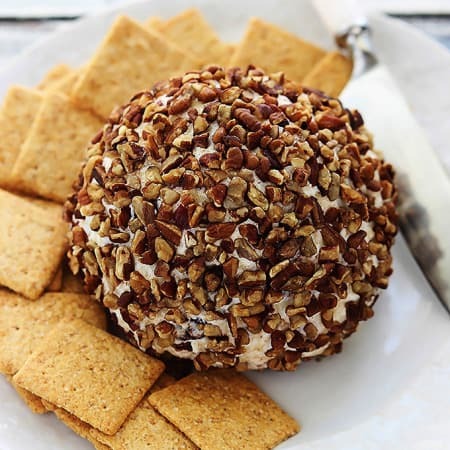 This is the best cheeseball ever, I made it last Thanksgiving and it was a huge success!!! I even gave the recipe to a couple of guests who loved the cheeseball!!! This will be my holiday go to appetizer, thank you so much for this yummy recipe!!! The cheesecake is great, really enjoyed making it. It was a hit with my family. This cheesecake is so good. It was a hit with my family. Fun to make. Can you make and freeze ahead? Hi Beverly! If you are going to freeze this, I recommend adding the pecans when you’re ready to serve! Make sure to wrap it in plastic wrap, tightly, then in a freezer safe bag!